All through May and June 1931 the fan magazines kept up their steady stream of items about Carman Barnes and how she was taking Hollywood by storm. 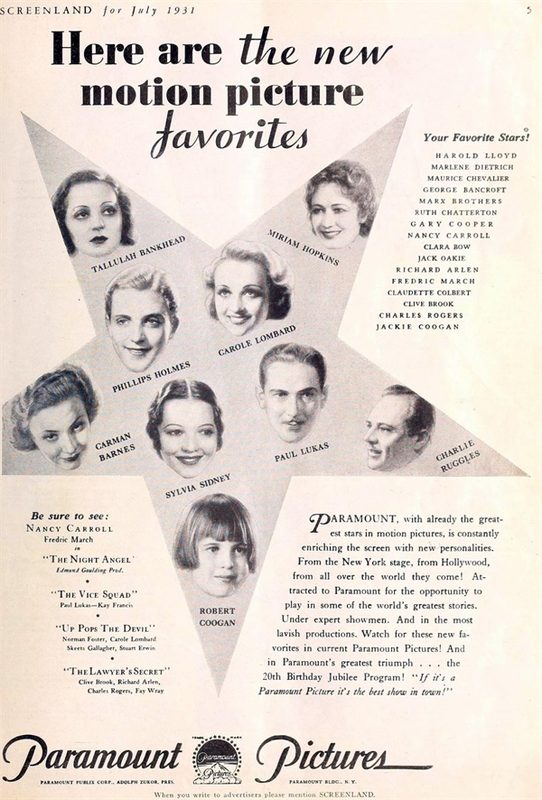 Paramount’s ads continued to list her among “These Great Personalities” and “Stars That Draw!” alongside such names as Marlene Dietrich, Maurice Chevalier, Fredric March, Harold Lloyd and Claudette Colbert. Strangers and Lovers was still one of “These Mighty Productions” coming soon, touted in the same breath with Dr. Jekyll and Mr. Hyde, Love Me Tonight, The Smiling Lieutenant and A Farewell to Arms. Readers of Screenland, Modern Screen and Photoplay were exhorted to write to her (at the studio, of course, 5451 Marathon Street, not her DeMille Drive digs) — even though none of those readers had set eyes on her unless they’d seen the pictures the magazines kept publishing. “Carman Barnes wrote ‘School Girl.’ She is under age. She was considered a genius. “Someone in the East saw her and decided she was Movie material. They signed her at $1,000 a week now; $1,250 a week in a few months; and $5,000 a week at the end of three years — provided the options are taken up. “First, she was to star in her own writings. ‘With and By Carman Barnes.’ A good thought, but when they came to adapt her story, this was discarded. “Then she was to play the part of a Southern debutante. “And here’s the funny side. Eight weeks are allowed on the production schedule on a not-too-big picture. When three weeks is a long shooting schedule for pictures in this day of hurry-up talkies. “And the eight weeks are to provide ample time for proper photography. The girl’s lines need much camera attention. “She has one lucky break. “Tom Douglas of stage fame has been cast opposite her. So Paramount was scheduling extra time to coax the new kid along, eh? Interesting. And by the way, what do you suppose York meant by the coy insinuation in that last line about Carman and Tom Douglas, the co-star she found “charming, very humorous…southern and from a good family”? In her April letter, Carman also told Clara Jackson that he was “not a ‘pretty’ movie actor.” Could that have been code for saying that Douglas was definitely heterosexual? Well, let’s let it pass — Carman, Tom Douglas and Cal York are all past asking about it now. 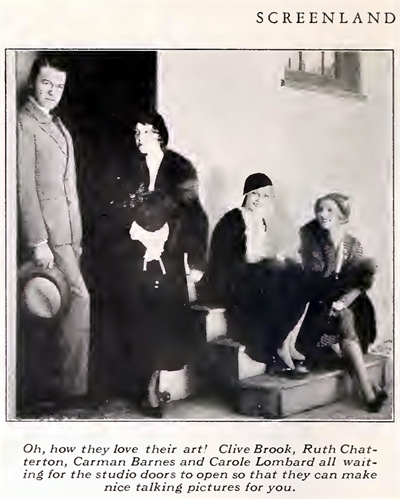 In the next issue of Motion Picture Herald (July 4), The Road to Reno was listed as “Shooting” — and sure enough, here’s a publicity still from the July Screenland (“Oh, how they love their art!”) showing Clive Brook, Ruth Chatterton, Carman and Carole Lombard loitering on the Paramount lot waiting for the cameras to roll on their respective pictures. The photo is posed, no doubt, but at least it offers photographic evidence that Carman was reporting to the set. Motion Picture Herald continued to report The Road to Reno as “Shooting” on July 11 and 18; then in the July 25 issue the picture’s release date was announced as September 26. One week later, on August 1, The Road to Reno — still starring Charles Rogers, Carman Barnes and Lilyan Tashman — was marked “Completed”. It was an ominous sign for any Carman Barnes fans who might have been paying attention; in fact, Peggy Shannon — who had already replaced Clara Bow in The Secret Call earlier in the year — had now replaced Carman. The Road to Reno was still scheduled for release on September 26, so reshoots were no doubt in progress, making the Herald’s “Completed” stamp a bit behind the curve, albeit not as far behind as Modern Screen. “As mystifying as any of Hollywood’s mysteries, the story of Carman Barnes. Picked and touted by Jesse Lasky as a find, Miss Barnes was subjected to a nation-wide publicity campaign a la Paramount’s best. The excitement even extended into trade paper advertising. There’s no telling what “the other day” from August 28 was, but this is the first mention in print that Carman and Paramount had come to a parting of the ways, barely seven months into her long-term contract. Motion Picture Daily presented it as Carman’s idea, but other publications told a different story, albeit weeks and even months later. In the meantime, gossip column items continued to drop her name (Motion Picture, September: “Carman Barnes reports that to date no one has tried to call her ‘Car’ Barnes.”), and readers were still being told they could write Carman in care of Paramount’s Marathon Street studios. But by October the news was finally sinking in. “The story of Carman Barnes is one of those things that could only happen in Hollywood. Maybe you remember that Carman is the youthful authoress who wrote the sensational novel ‘School Girl’ and if school girls had acted like that in Old Cal’s day, they would have been spanked and sent to bed without their supper. Instead the authoress was signed under contract to Paramount to write her own stories and play the starring rôles in them. “The executives raved about her — never, so the press was told, did a girl have so much of what it takes. “The publicity department was told to give Carman a big sendoff. “She was photographed from every angle — well, almost. She was interviewed and kowtowed to and flattered. “Various announcements of her screen rôles were announcements, merely. She was assigned to ‘Road to Reno,’ but Peggy Shannon was substituted, and even her own play, ‘Debutante,’ was put aside for lack of a story. Now, it seems, Paramount will not renew her contract. And she’s never appeared in a single picture nor written a line that has reached the screen! It’s amusing now, 86 years down the line, to see how schizophrenic some of Carman’s fan magazine coverage was becoming by this time. The October issue of Motion Picture is a case in point. Carman gets four plugs in all. One of them, in the magazine’s regular “The Hollywood Circus” feature, mentions how dinner party hostesses around town, including Carman, were having trouble catering to the finicky palate of Paul Lukas. It’s standard puff-stuff, a good way for studio publicity departments to keep their contract players’ names in print (whether Carman ever actually threw a dinner party and invited Paul Lukas is an open question). Now this was a low blow. The reporter knew perfectly well that the studios always took “literally hundreds” of pictures of their contract players — stars like Garbo who could sit for half a dozen shots, every one pure gold, were rare. “Several pictures”? Well, there were certainly several titles bouncing around. Maybe that was what Marion Martone meant. “Paramount has finally settled with Carman Barnes for a cash consideration for the balance of her contract, which had six more months to go. Miss Barnes was discovered by Jesse L. Lasky in New York, after he was attracted to her ability as the author of a sensational book on boarding-school life. 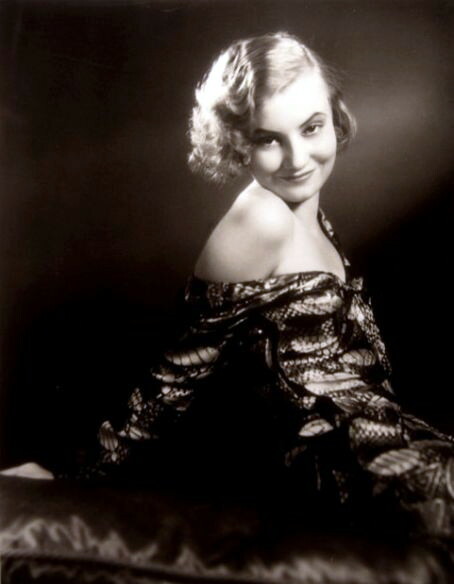 She was later sent to Hollywood where the studio applied every trick known in photography to bring out that certain screen magnetism so necessary to establish popularity, but the young girl would not respond to that mysterious element of camera lens with the result that Paramount decided it was cheaper to relieve themselves of the charge by making a cash settlement. In any case, by Autumn 1931 Carman Barnes was well and truly gone. No more horseback riding in Griffith Park, no more lolling on the beach, no more “primieres” or bad food at the Brown Derby. And that novel Miss Barnes was said to be writing? We’ll get to that, and other things, when we return.